Some of you may remember from our trip through the Rockies our Swiss friend Wendelin, well this afternoon we arrived on his doorstep in Lucerne. 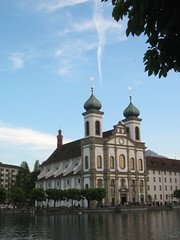 It was an 8 hour trip from Rome on two different trains so you can imagine we were very glad for a shower and a sample of Lucerne’s local beer, Eichhof. Tomorrow we shall do some exploring but for now we are going to sit back and relax by river Ruess and catch up with Wendelin and his flat mate Pascal.